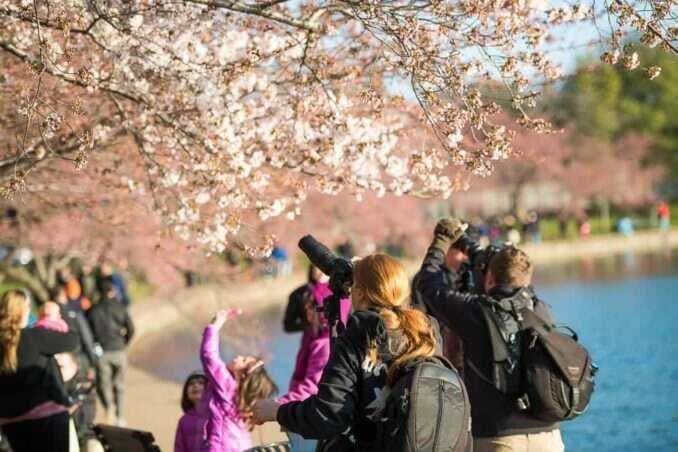 Here's a photo timeline of what to expect with the blooming of Washington DC's cherry blossoms, from roughly a week before the peak bloom to about a week after. So here's the quick version . . . It's impossible to say with 100% certainty how long the flowers will be out because so much depends on the weather. It can be as long as two weeks or as little as four to five days. 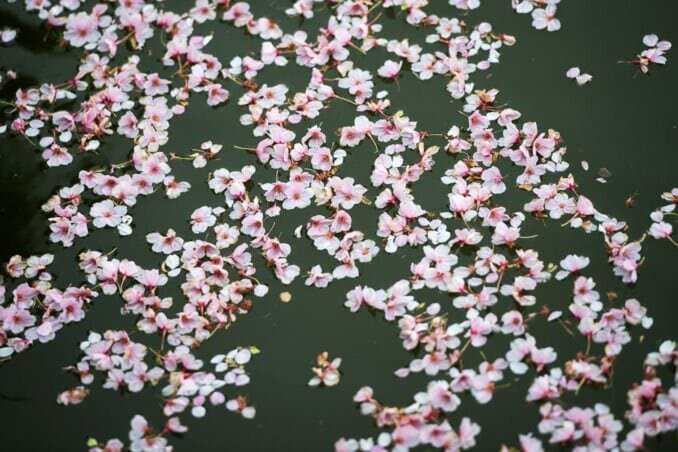 As the blossoms move past their prime, the flowers become more fragile. In cool, calm, and dry conditions they can hang around a week or even two. 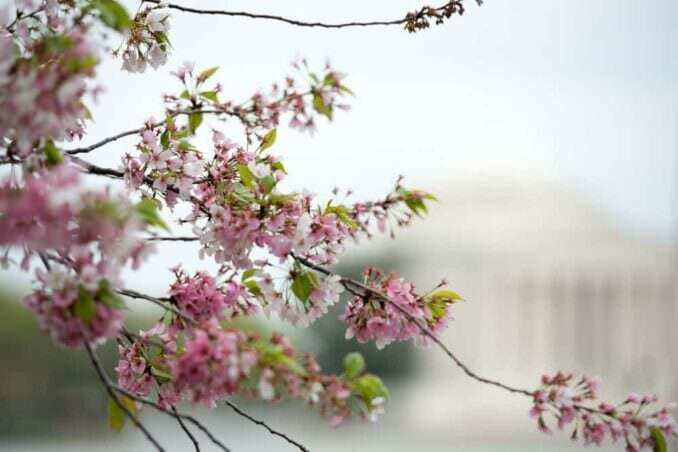 But because the flowers are becoming ever more fragile with each day, it also means they're becoming more vulnerable to rain, wind, and storms, all of which can knock the petals off, and all of which are part the standard unsettled weather that the DC region sees in the spring. The photo timeline below gives some visual idea of what you can expect in the days before, during, and after peak bloom. 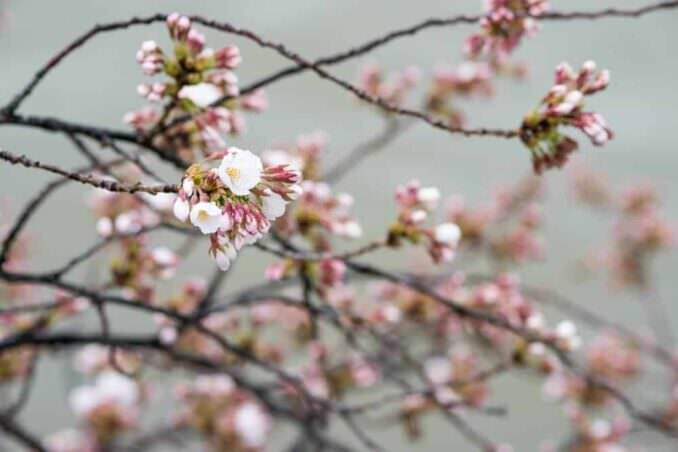 There are several stages to the bloom of a cherry blossom tree, but the whole process is a constant state of transition and relatively brief. Once the flowers come out they typically last a week or two. Precisely how long the flowers stay out varies depending heavily on the weather. In hot, rainy, windy, and stormy weather they'll go more quickly. In cool, calm, and dry conditions they hang around longer. I get a lot of questions about how long DC's cherry blossoms last and whether there'll be anything to see on such-and-such date. So I've put together a photographic timeline of photos from previous years that illustrates the progression from about a week before the peak bloom to about a week after. The whole process is a transition, and it changes day to day. 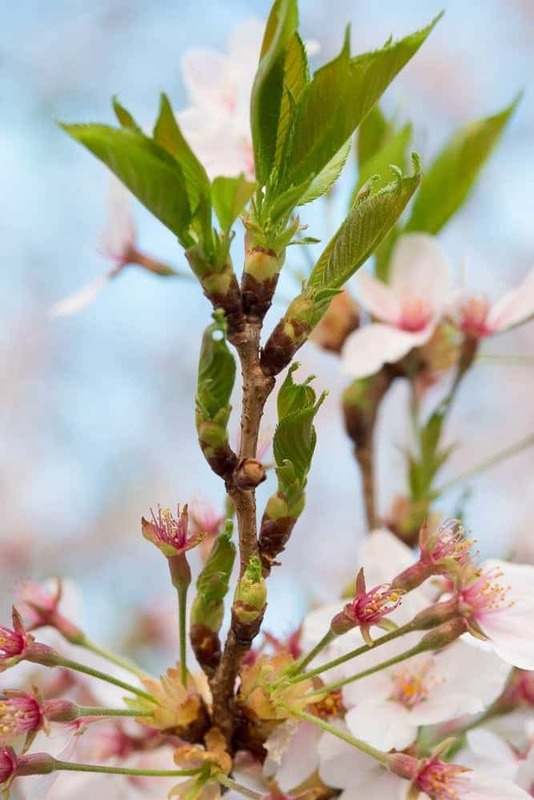 There are some things to bear in mind in looking at this timeline of the bloom of a cherry blossom tree. Firstly, these are not hard and fast rules. The trees will do as they please, and the blossoms react to the weather. There can very easily be variations either way by a day or two or more. So when it comes to predicting what will happen, the schedule below should be read with an implicit "approximately." And to give some idea of the variation we might see, in 2006 the bloom lasted a weekend; in 2016 it lasted about a week. In 2018, they were still looking lovely 8 days after peak bloom but then disappeared within a couple of days of that when rain and wind arrived. Secondly, the times here are relative to peak bloom. That's the day when the NPS arborists look closely at the trees and judge that 70 percent of the blossoms have opened. 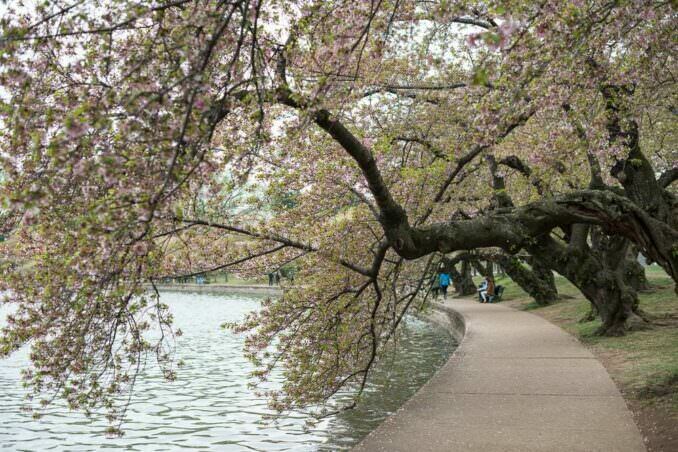 We won't know exactly when the peak bloom day is until it happens. 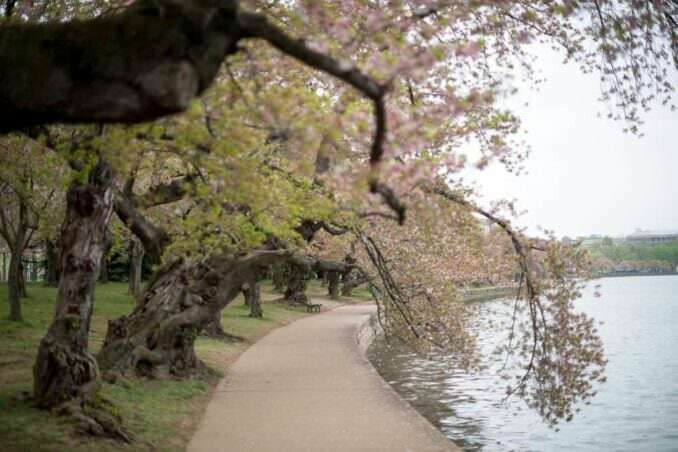 And peak bloom is a specific day, so when you see forecast ranges like April 11-14, it means that the peak bloom date is expected to fall on one day in that range. 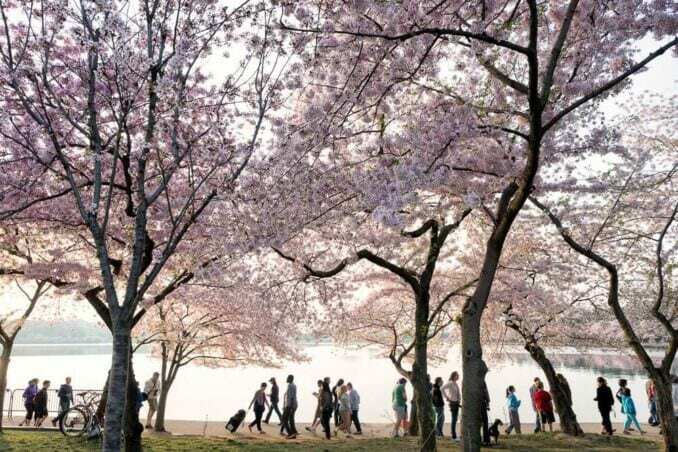 What it doesn't mean is that the peak bloom lasts for the entire period from April 11 to 14. You can find out much more in my post about what peak bloom means and why it matters. And you can find the latest 2017 peak bloom forecasts here. Thirdly, while it's remarkable how the trees bloom at roughly the same time, not every tree blooms at precisely the same time. One tree might start blooming while the one right next to it is still several days away. There can even be variations on different branches of the same tree. The process will start with some scattered trees getting a jump on the others. So even a week before it's quite possible you might find some scattered trees starting to bloom. The process then accelerates as more and more trees join in. After the peak bloom, there are inevitably later bloomers that hang around a little longer than the others, but again, you might have to go hunting for them and their numbers will diminish the further from peak bloom we get. The blooming period can last a couple of weeks, or it can last just over a week. The photos below were all taken in the past few years. As you can see, there's some variation from year to year, but they should provide some idea of what to expect before, during, and after peak bloom. To give you an idea of what the process looks like speeded up many, many times, here's a timelapse I shot of the flowers blooming. It captures about five days or so, through the peduncle elongation, puffy white, and peak bloom stages. 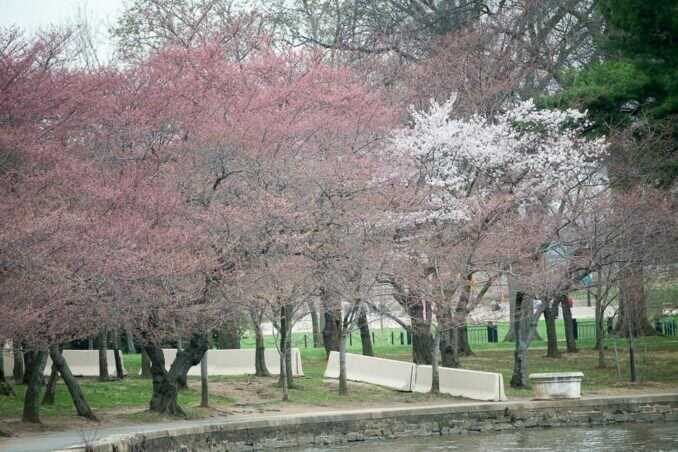 A week before the peak bloom, some scattered trees will likely start blooming. But it probably won't be many and you'll have to go looking for them. There's one tree that reliably blooms about a week ahead of the others. It's known as the indicator tree--here's how to find it. 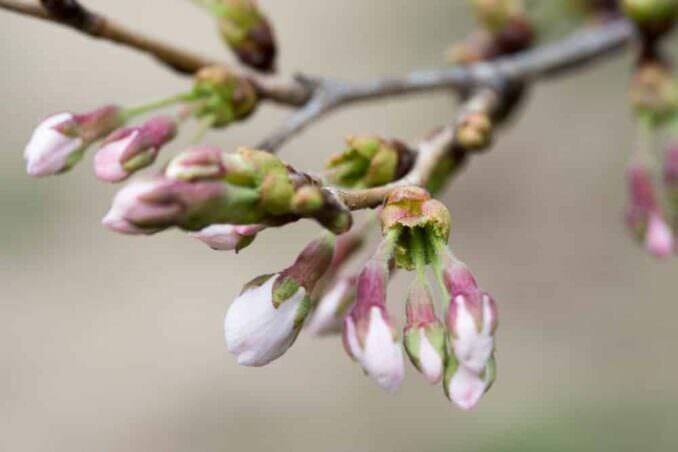 During this period, some of the other flowering trees will be coming out, such as the tulip magnolias and some of the other early flowering fruit blossoms. 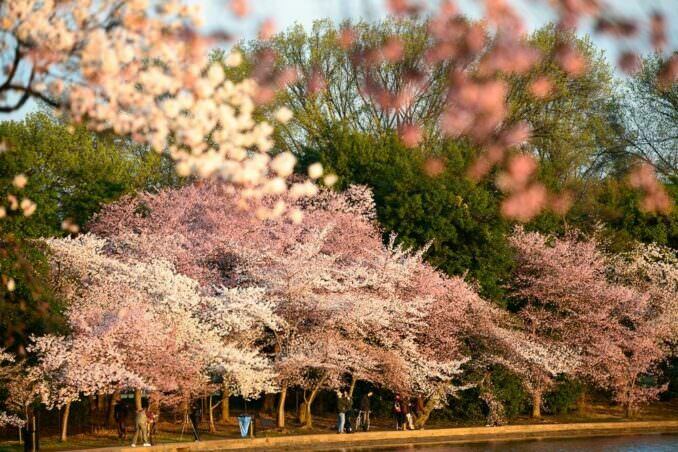 During the period about 3 to 5 days before the peak bloom, it becomes much easier to find trees that have started to bloom, with more and more opening each day. But most of the trees are just starting to pop. From about 2 days before peak bloom to 2 days after is for all intents and purposes full bloom. It's prime viewing time and the closest thing to a safe zone. 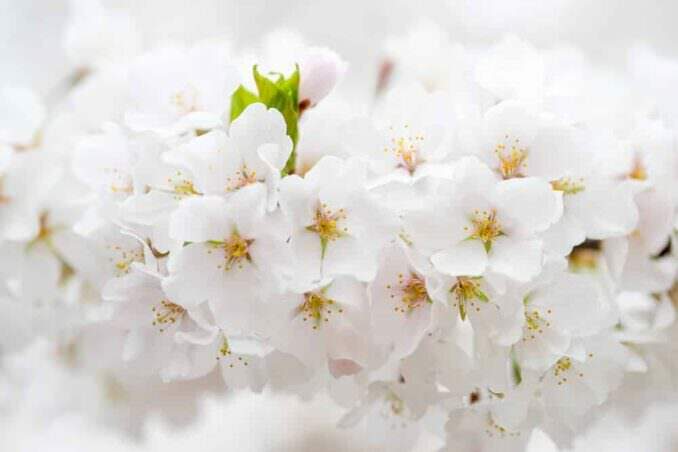 The flowers start white and gradually turn pink. At the start of this period, not all the flowers will have opened yet. The peak bloom day is when 70 percent of the flowers are determined to have opened. 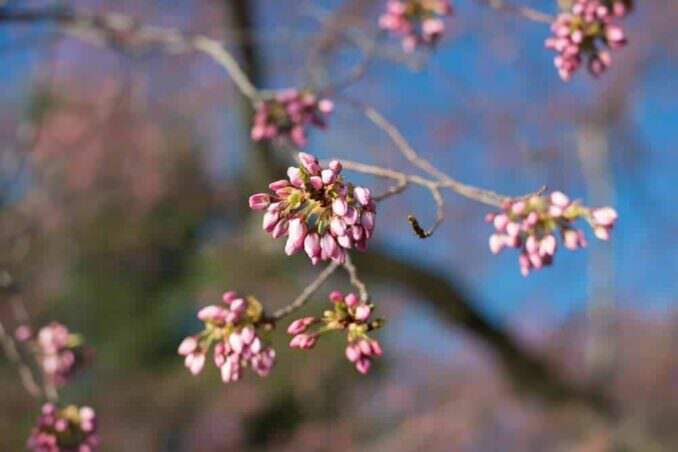 By the end of the period, the trees that bloomed early will have started to drop some petals. 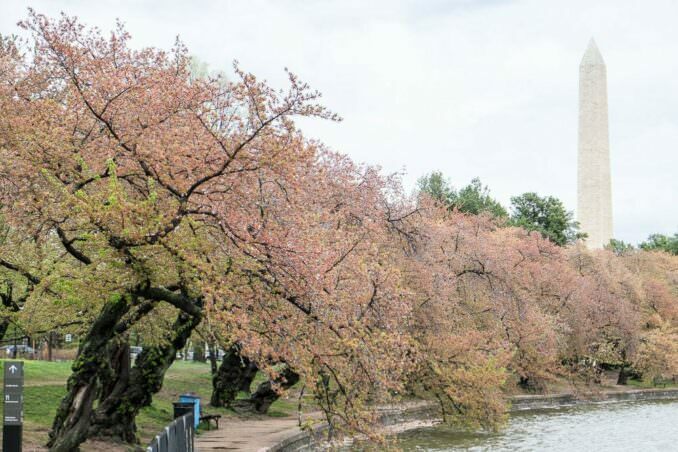 Roughly three to four days after the peak bloom date is the pivot point when the trees will go pretty quickly from what is essentially full bloom to the petals dropping off and getting replaced by green leaves. Precisely when it happens depends, as usual, on the weather. Storms, wind, rain, and high temperatures can all accelerate the process. In a good year, the flowers can be looking absolutely splendid 3 days after the peak bloom. In other years they're well on their way out. So this period can be touch-and-go insofar as what you're likely to see. By now, it's quite possible that the trees will still be looking lovely. 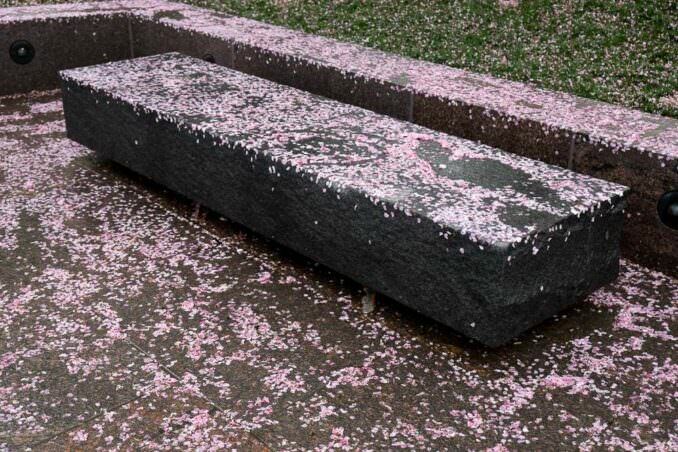 Or they might be done, with the ground becoming covered in pink petals and the flowers being replaced by green leaves. But there is quite a lot of variation from year to year, and it is possible for there still to be plenty of blossoms to see even 6-7 days after peak bloom. You can see some examples of the the very different scenes from year to year in the photos below. Heading to Washington for the weekend and have discovered your blog. You noted that the ‘peak’ was earlier this week... any advice for seeing them this weekend? Any areas around the tidal basin that might still be at peak? Or are the blooms still looking good most anywhere? I've just posted some photos taken early this morning in the rain here. 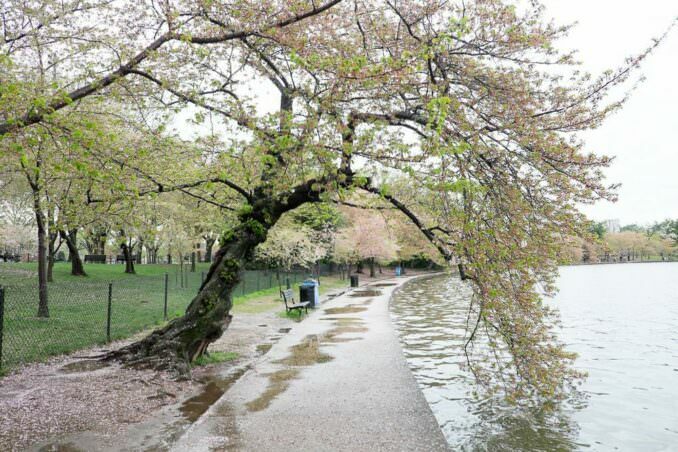 Tidal Basin is still a good bet, even if the trees are moving past their prime and the rain is knocking petals off. This Sunday 3/31 - Can we expect it be at least 80% bloom? Please let me know. 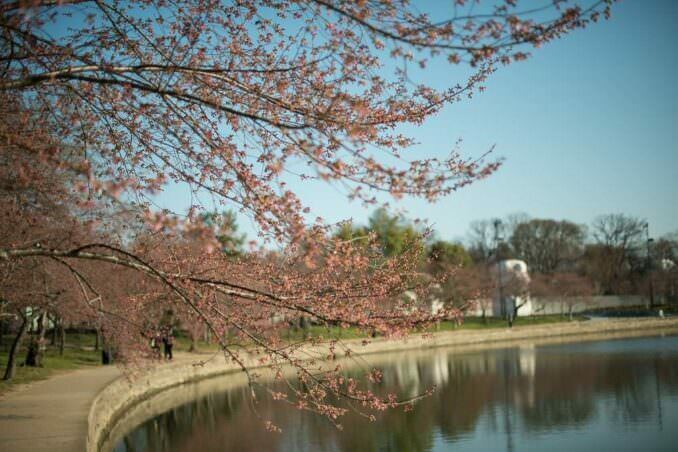 Peak bloom is, by definition, the threshold when 70 percent of the blossoms are open. The NPS expects that to happen on Monday. So it will likely be less than 70 percent out on Sunday. Hi David- Have followed you for years! Great information!! Question for you. 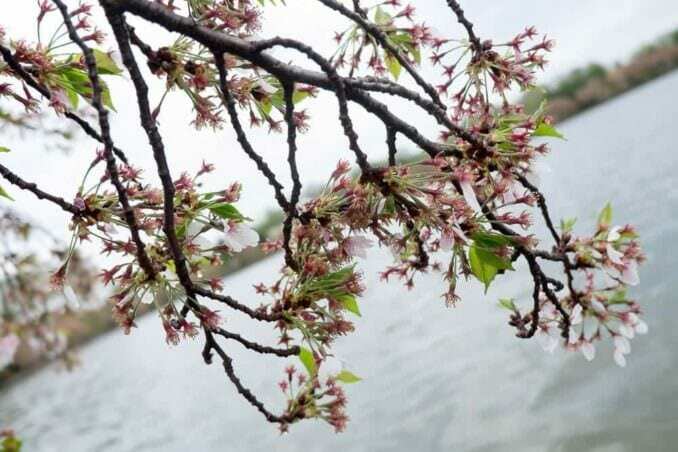 Are there a different variety of cherry tree to be found around East Potomac Park, or anywhere in DC, that bloom slightly later than those surrounding the Tidal Basin? I’m doing a maternity shoot that isn’t supposed to be until the 7th or 8th (they are flying in), and I’m afraid the blooms will be gone by then. Appreciate any ideas! Also, can you drive or park at East Potomac Park at this time? There are certainly some that are lagging behind, but no particular spots come immediately to mind. I'll keep an eye out in coming days. For now, there's normal access to East Potomac Park, but I would expect the special traffic restrictions to be put in place this weekend. thanks for all the awesome information..I am actually going to come next week..1st time ever! to see these trees. I have a hotel & flight and all that so I am pumped. I know it's probably never possible to shoot scenes with no people in them..or is it? I'l be staying on Connecticut ave..at the Hilton...I figure its walking distance. so I could get there early am, or stay late evening..
since bloom seems to be peak during the work week, will that impact crowd size? I would imagine there are other locations for tree viewing..do you have any favorites you'd like to share, maybe less popular? It is possible to get people-free shots, but it really depends when. If you're there during the main rush on a weekend during the peak bloom, it's very hard to avoid people--it's just plain crowded. Your odds increase markedly on weekdays and very early or very late. It's much less crowded during the work week. It's all open public space that you can access any time of the day or night. There are no gates or tickets required. There are several other locations that are good. I've put together some ideas here. Barring some particularly unhelpful weather, there should still be plenty of blossoms out. As of right now, the odds look good that the peak bloom might fall during the work week next week sometime. It should warm up this weekend, which will bring out a lot more flowers. So they should be looking pretty both weekends. And yes, it's been very normal weather this year, and not nearly as exciting as some other recent years (in a good way!). Thank you! If you don’t mind - We are taking the train from Richmond - what station should we get off at and what’s the best way to get where we need to be? You will get off at Union Station, which is on the eastern end of the National Mall. The Tidal Basin is towards the other end of the Mall. It's quite possible to walk, but it's a longish walk (about 1.8 miles). The cheapest option is to take the Circulator Bus from Union Station to the Jefferson Memorial or MLK Memorial, both of which are on the Tidal Basin (the Circulator Bus is, as of a few days ago, now free). The closest Metro station is Smithsonian. L'Enfant Plaza is also quite close but on other lines. You can also get a taxi/Uber/Lyft. You can find more information on how to get there, here. 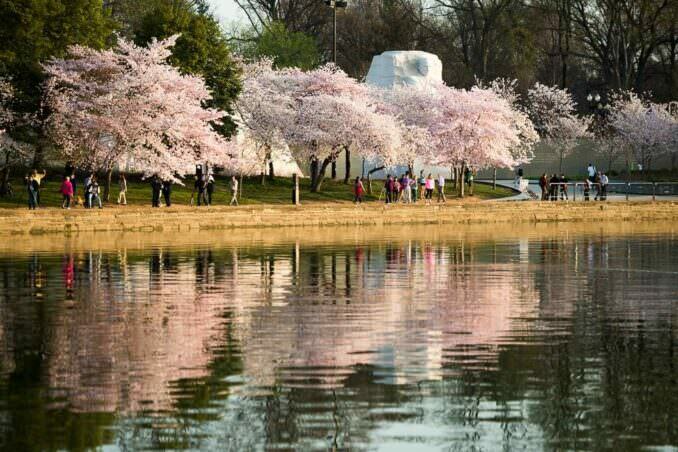 Hi, I know the peak bloom of this year is from 3-6 April but if I were to visit DC on the 12th which is almost a week after it bloom, do you think its worth the visit,(with the temperature and everything)? 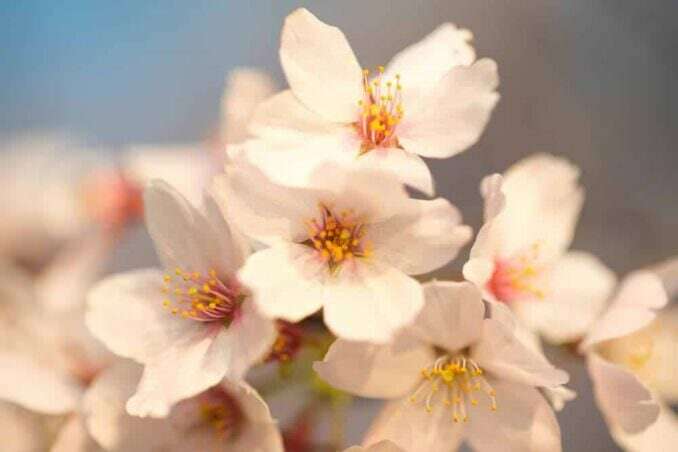 Since you seems to know a lot about the cherry blossom, I would like to hear your thoughts. Thank you so much! It's really not possible to say for sure in advance. That because of two things. Firstly, when peak bloom actually happens. The current forecast is sometime during April 3-6. That may or may not end up being accurate, and if it falls on April 3 it will make quite a difference compared to April 6. 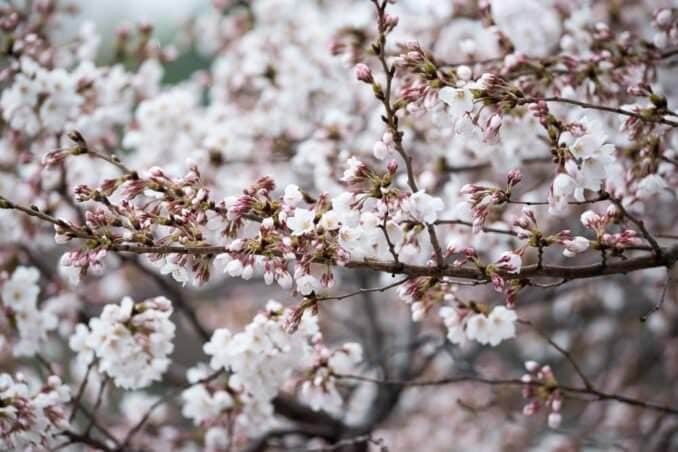 That's because after the flowers reach full bloom they start becoming more fragile, and in that state they become particularly vulnerable to the weather. If it's cool, calm, and dry, they can hang around for as long as two weeks after the peak bloom date. 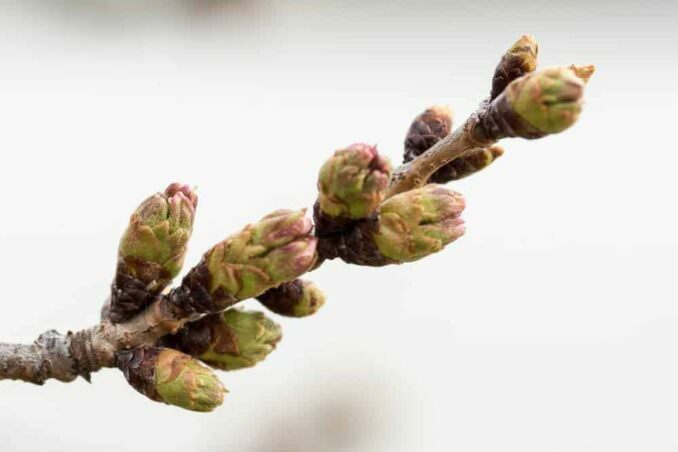 If it's stormy, windy, warm, and rainy, that can all chase the blossoms off in as little as 4-5 days. And the weather here at this time of year can be a mixed bag--we could get all of those different conditions at various times. So the short version is that they might still be looking beautiful, but there is real risk that they won't be. For a visual sense of what to expect in the period after peak bloom, take a look at this visual timeline using photos from past years. I realize that doesn't really clear things up for you, but as with so much about the blossoms, it depends on the weather we end up having. David, I was spacing out watching the time-lapse photos of the Yoshinos blooming. After they had all fully blossomed, I actually smelled cherry blossoms! How do you do that? So if the Peak bloom is April 8-12 ... .which weekend should i come to have the best views of the trees ---- weekend of the 6th or weekend of the 13th? I'm currently leaning towards the weekend of 7-8, but it really depends how much the cooler temperatures this week slow things down. We travelling from 14th April to 29th April. Tokyo, Kyoto, Osaka, Hiroshima. Was hoping to at least have glimpse of the falls of Cherry Blossom. 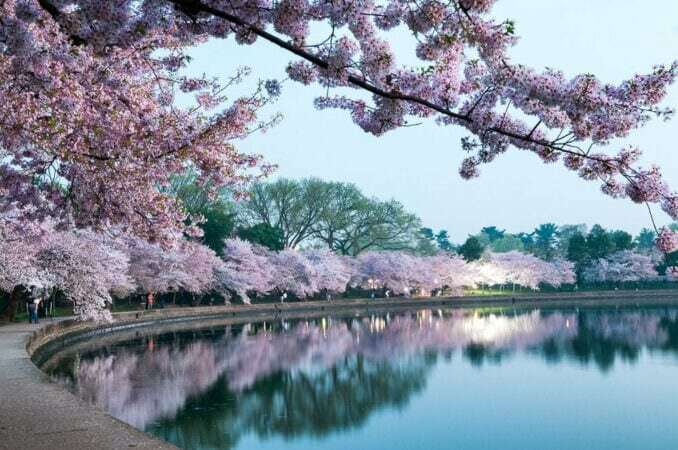 Sorry, but this is focused specifically on Washington DC's cherry blossoms and I don't have any information on the bloom in Japan. Hope your timing is good, though! Hello! We will be in DC from April 20th-24. What other flowers are blooming around that time? Tulips are an April highlight. There are lots of good spots for them, including the US Capitol grounds to the Floral Library, the Netherlands Carillon. There are, of course, many others. Dumbarton Oaks, which is an absolutely beautiful area in the downtown area and well worth visiting, has a detailed list of average times various blooms come out. They also maintain a blog that covers what's blooming there. River Farm, nearby (and once owned by George Washington), also has a very wide variety of plants in a beautiful setting on the Potomac. I can't immediately find their 'what's blooming' section, but I seem to recall they had one somewhere on their site. And the National Arboretum is also definitely well worth visiting. You can find their guide to what's blooming here. well I guess airplane tickets are not suited to cherry blossom viewing. 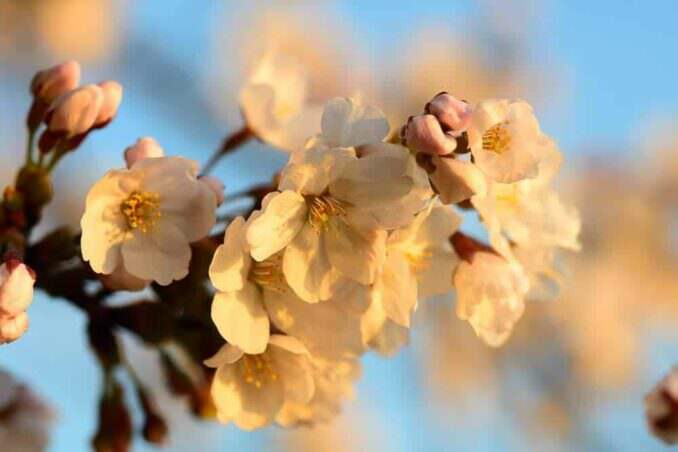 I picked the weekend of the 31st and the whole family is coming------historical peak bloosm is early april, and I know and believe in global warming so I picked the weekend earlier. I bet peak bloom is almost always going to be in mid-March now. Do any of you experienced cherry bloomers think there is is chance they will be there the weekend of the 31st? Reading your detailed blogs & watching the weather reports for DC. Scheduled to be in DC on Sun. April 3rd, will there be any cherry blossoms to see? Thanks so much. Hard to say exactly, but more on this question in today's update. I am planning to visit around the week of April 11 to 14. Am I still able to see the cherry blossom? The main ones will be long gone by then, but you might catch a variety that blooms a couple of weeks later. More information on them here. flowers we can see during our visit? The tulips should be out then, which are all over the place downtown and along the George Washington Parkway and are highlights themselves. There are also a lot of other flowering plants in the area. Here are some ideas on places to catch them. It's also possible you might catch the start of the Kwanzan cherry blossoms--I have more on them here. Enjoy your visit! This blog is amazing. I am trying to sign up for updates via email since I do not have facebook, but I only see the facebook option for how to get updates for next year. Is there anyway you can assist? I would really love to be able to see them and keep track for next year since I live in TX. Thanks! Thanks, Sylvia. I've added you to it manually. It's possible there will still be some late ones around, but it's more likely that they'll be well on their way out or gone by then. Your blog is a HUGE resource and is MUCH appreciated. I remember tuning in to your updates in 2014 as I am this year. No other site comes anywhere close to the extreme helpfulness and detail you provide free of charge. big THANK YOU! You're most welcome! Glad it's useful! This is probably already been asked, and I apologize because I'm sure you answer the same questions on a daily basis; but when is a good time (time of day) to beat the crowds? I want to get good exposures with as little people as possible. Weekdays in the early morning are generally good. Tour buses tend to start rolling up after 9-10ish, and there'll be a lot of them next week with spring break school trips. And then it can stay pretty busy through the rest of the day. That said, it's a huge area that can absorb a large number of people, and it can also be surprisingly quiet on a weekday. These were taken on the actual peak bloom day last year, which fell on a Friday. As you can see in some of the shots, crowds weren't a problem. Compare that with the crowds there well before sunrise the next day and on the Sunday (the latter was even with the Cherry Blossom 10-Miler complicating things). We cannot get to DC until 3/30, but next year we will have more flexibility. 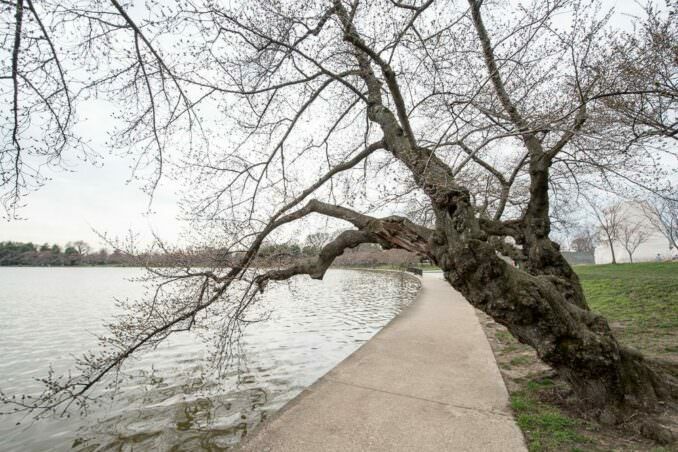 Will there be blossoms one week after peak bloom of 3/23? If they end up meeting the peak bloom threshold on March 23--and that's a very big if at the moment--odds are against there being much left to see by the 30th, although there are usually some stragglers. But it's also quite possible that they might not reach peak bloom until a few days after that, in which case the chances improve quite a lot. For argument's sake, if the peak bloom ends up being March 27, they could still be in close to full bloom on the 30th. Based on what we currently know, it's looking likely they'll be done before then. You might catch the Kwanzan cherry blossoms, which are also very pretty and bloom a bit later. More on them here. You can also follow the daily updates before then here. Hello! AMAZING site and information here! I'm planning to visit mid April during the Festival for the weekend. Will I be able to see the blooms at all or will that be too late? It will be too late for the main cherry blossoms (Yoshinos), but there's a variety that blooms a couple of weeks later that you might catch. I have more about them here. Excellent blog! Thank you so much for providing us with lovely photos and the info on timing to see the trees in bloom. Missed the blooms when we visited two years ago, but your information will make it easier to plan a return trip! 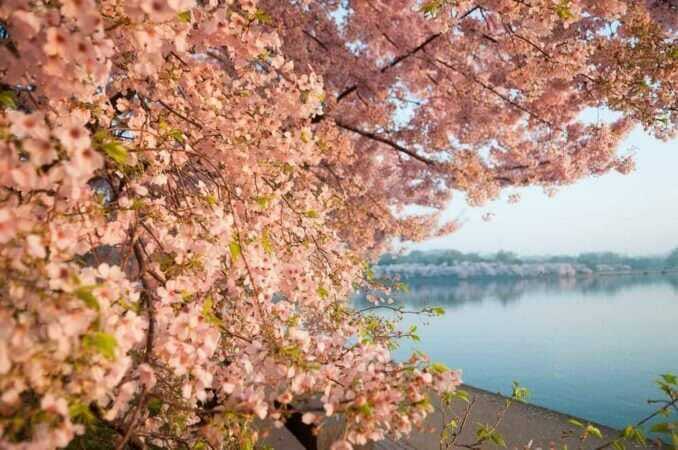 This is my first time going to Washington DC for Cherry Blossom. I am thinking about going there on March 26. is that a good time go? I know its really depends on weather but what do you think? It looks like that's going to be good timing to see the blossoms. The crowds will be out for Easter weekend. Will there be anything for me to see this Saturday the 1st?? Is it worth the 5 hour drive? Prospects are looking better today than they were yesterday, but it's still hard to say with much confidence. The problem is that the petals are now getting fragile, and any rain or wind is going to knock them off. As of right now, the weather forecast is calling for light rain all day Friday. That's not ideal (though is admittedly better than heavy rain). I've just posted some new photos of how they're looking this morning. Last year we went during peak bloom, I believe april 10. Everything was puffy white. I want to take pictures of them fluffy pale pink this year. I'm confused, are they white first, then pink or vice versa? We just had twins so I would love to take family pics when they're pink. Would you recommend Hains point early in the morning being a good place to get wide shots without tourists in the background? Thinking next weekend. We are local and are ready to pick up and go when they're pink. Thanks in advance. 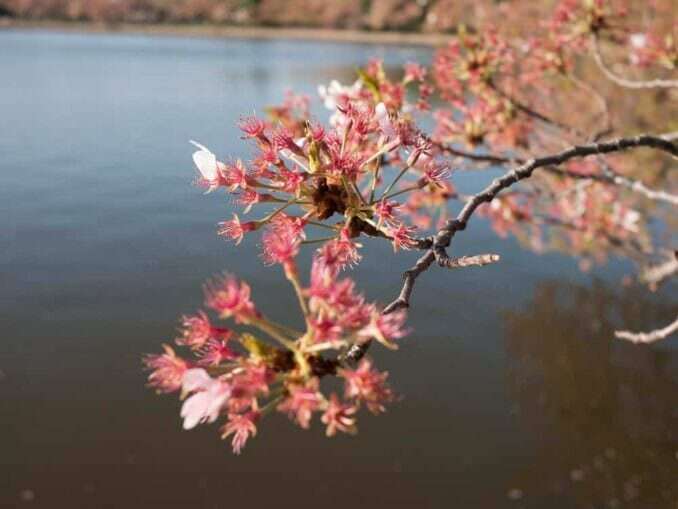 This is the first article/blog that really explains the cherry blossoms. Everything else is so ambiguous. Thank you in advance! They start white and turn pink over the course of a few days. My personal favorite time is 1-2 days after peak bloom, when they're becoming more pink than white. Three days after can also be beautiful and an even darker pink, but they're also starting to get fragile then. That's not a problem if the weather's calm, but as you know we can get storms and/or rain at this time of year that can knock them off. The very early sunlight right after sunrise can also help bring out the pink (or, for that matter, right before sunset). thanks David! 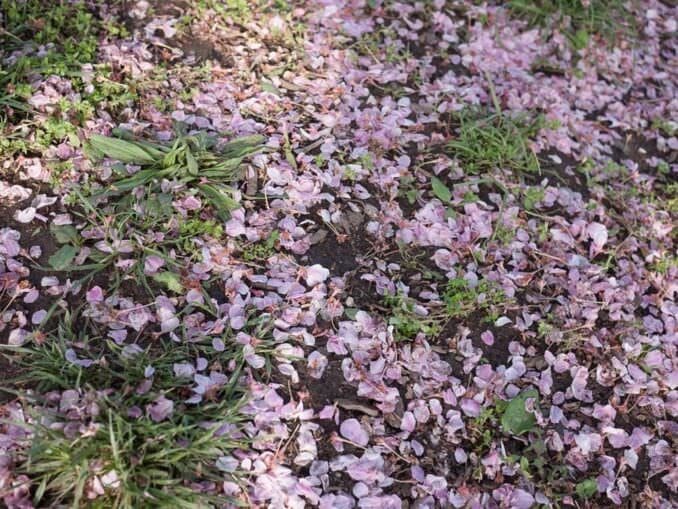 I love pictures of when the pink petals start falling on the ground. When would you say this is? Typically around 4-5 days after peak bloom, with rain helping. Here are some from April 15, 2014, and here are some from April 14, 2015. 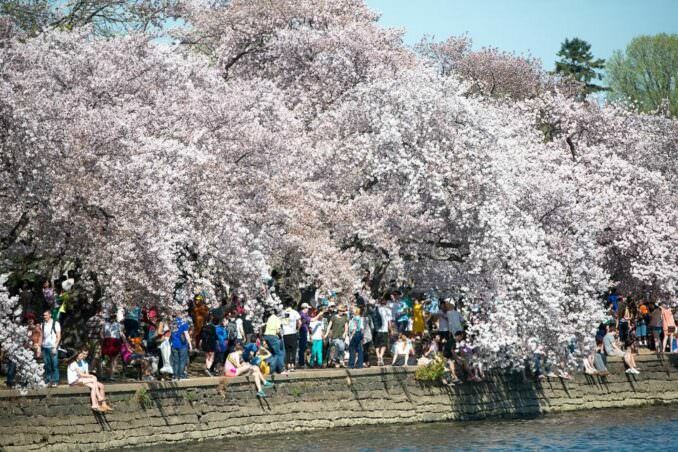 In both years, peak bloom fell on April 10.
wow thank you! 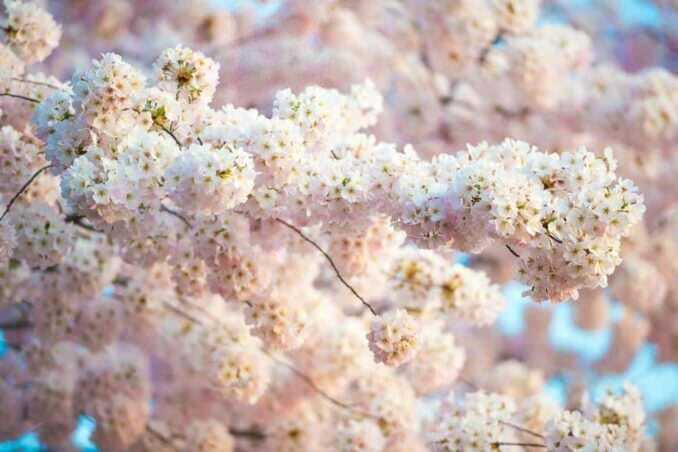 You are seriously the patron saint of cherry blossoms! 🙂 Nothing compares to your site! So we booked a mini session with a photographer on Sunday morning at 7am. Do you think that's a good time? The flowers should be looking wonderful. So if the weather's good it should be a very good time to do it. 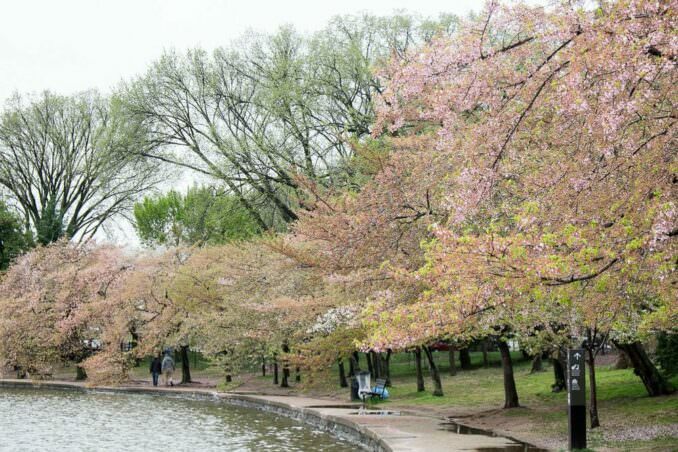 We plan to have a trip to DC on Mar 20 to see Cherry blossoms. 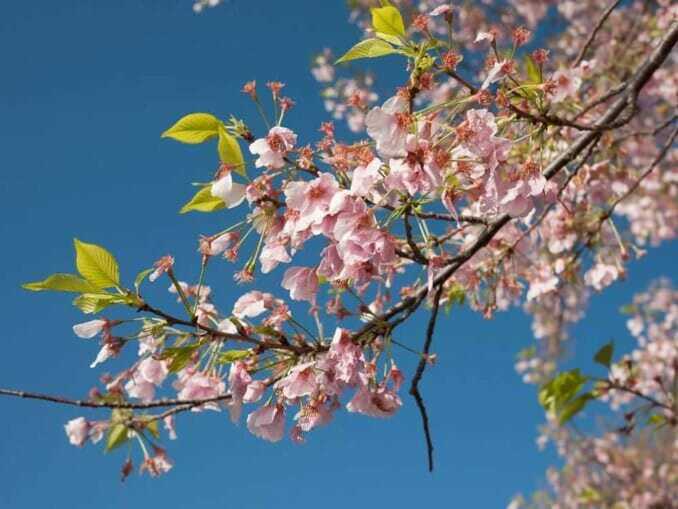 Is this a good time to see Cherry blossoms? We never go there before, please advise us where I should find the parking space and close to park. We drive from NY to DC. At this pace it looks like a good bet, although it's still not entirely clear exactly when they'll reach full bloom. But there are flowers out for several days before and after the peak bloom date, so there should be plenty to see. Here's info on transportation and parking. Thank you very much for your advising me. From 03/20-03/27 which date should we go to avoid crowded and see more Cherry blooming? 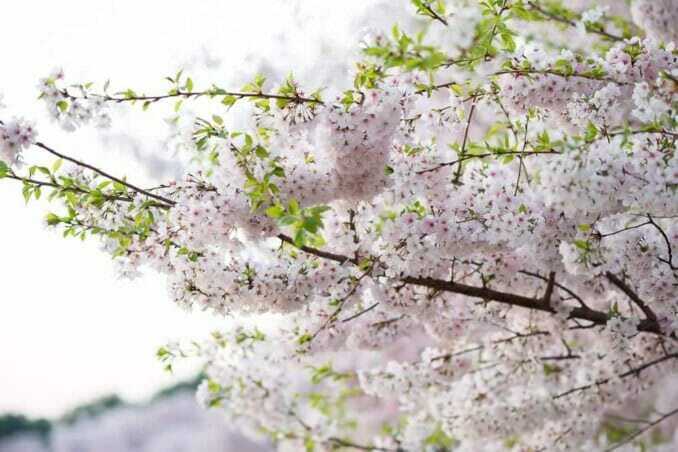 When the cherry blossoms are in full bloom, weekends are going to be very crowded, especially if the weather's nice. Week days are often less crowded. 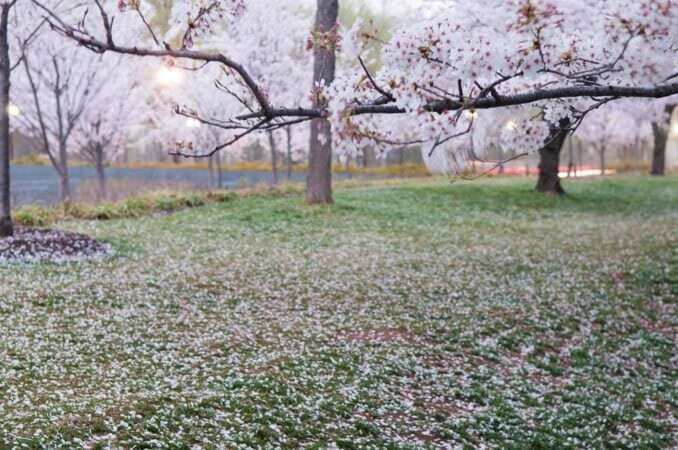 Very early in the morning can also be less crowded, although there can be a surprisingly large number of people out even before sunrise when they're in full bloom. We are planning to visit next weekend ie week 19-20 do you think it will be the best time to visit but too much crowded too? If they're in full bloom over the weekend it gets crowded. There's no real way to avoid that, although very early in the morning can be a less crowded time. The busiest times tend to be mid-morning on. For the upcoming Cherry Blossoms are dogs allowed to join us as we walk in the area? We are traveling from NY and we try to take our dog who is a rescue to as many outdoor places as we can to enjoy together. Thank you. 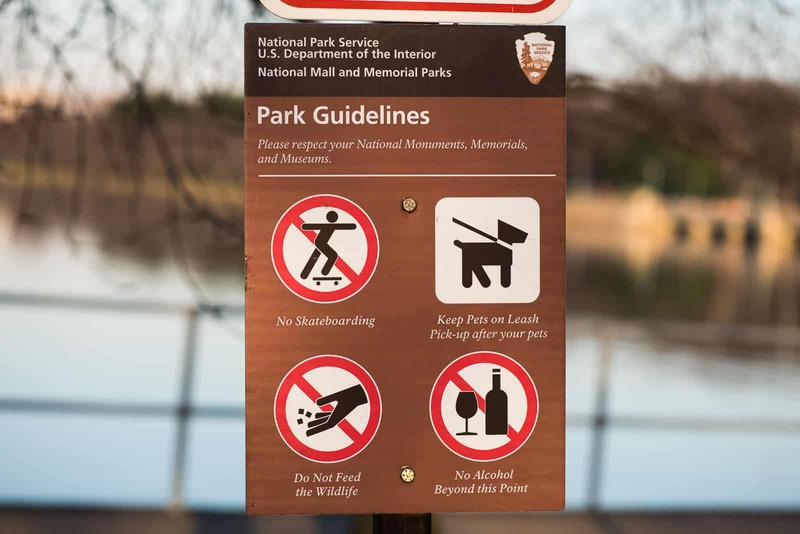 The NPS signs along the Tidal Basin walkway, like this one say no, but I haven't seen it being enforced. I've investigated this a bit more and need to modify my answer. 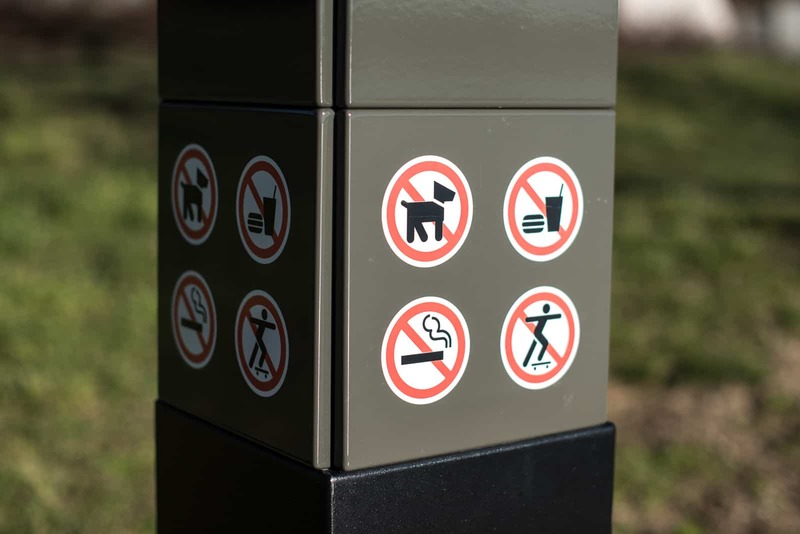 There are signs like the original one that show "no dogs" and there are other signs around the Tidal Basin that explicitly say they're okay so long as they're on a leash, like this one. So, as the very least, you're on safe ground to take a dog on a leash and can point to signs that say it's okay. But I also asked an NPS Ranger this morning, and they confirmed that dogs are fine so long as they're on a leash. There seems to be a distinction between the MLK Memorial and the plaza of the Jefferson Memorial and the rest of the Tidal Basin, but it's not a practical distinction since they all blend into each other. I've certainly seen lots of people walking dogs down there--including several this morning--and I've never noticed anyone being hassled about it. 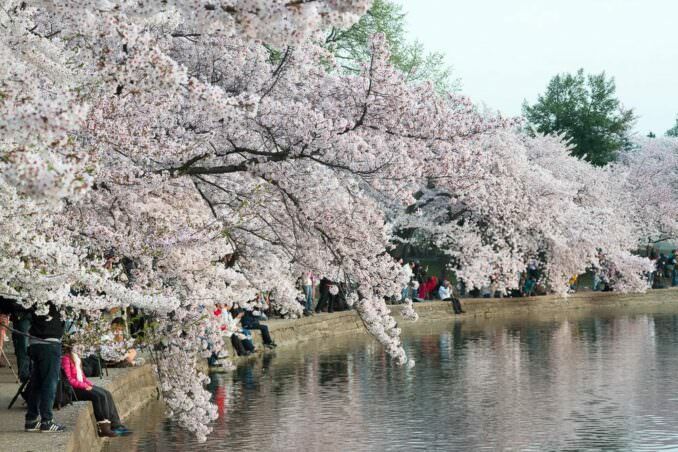 My sisters and I are planning to bring our 94 year old Mother to see the Cherry Blossoms this year just before her birthday on April 8, 2016. 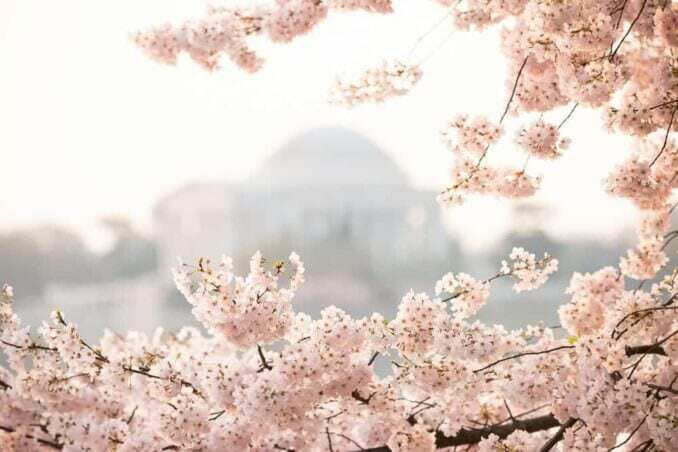 Seeing the Cherry Blossoms in bloom is on her bucket list. Can you make some suggestions for how we can get our mother to see them in comfort? She uses a walker but I don't think she could walk that far. Are there small golf cars or other transports for older people? What ideas do you have? Is there a particular spot we can view them from? Thanks so much for all your help!!! Your posts are great and much appreciated. There aren't any transports provided, as such, although much of it is wheelchair accessible. 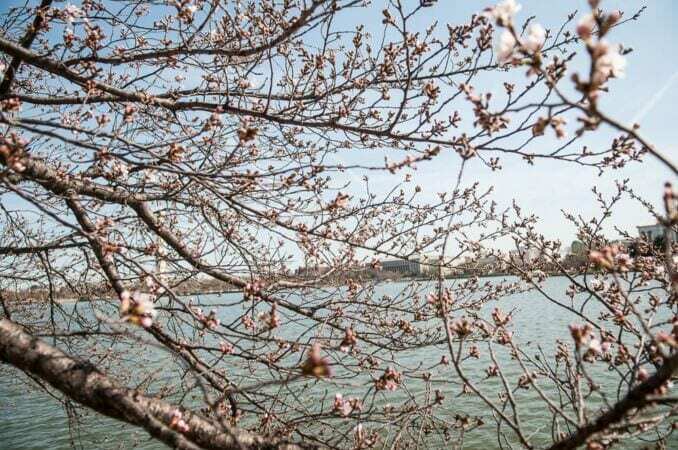 There are accessible parking spots right next to some of the memorials (MLK Memorial, FDR Memorial, and Jefferson Memorial), although during the bloom there can be a lot of competition for parking. If you can manage to get one of those spots or be dropped off there, it's a very short walk to be amongst the cherry trees--perhaps 50 feet or so at the closest. There are also plenty of park benches all the way around to stop and rest and admire the view. If walking distances is an issue, I usually recommend either parking (if you can) or being dropped off in the loading zone right next to the MLK Memorial or FDR Memorial (they're adjacent to each other). They're both right amongst some of the oldest and grandest cherry trees and right on the waterfront. The MLK Memorial doesn't have any steps on a gentle slope down to the waterfront, while the FDR Memorial has some ramps alongside steps. 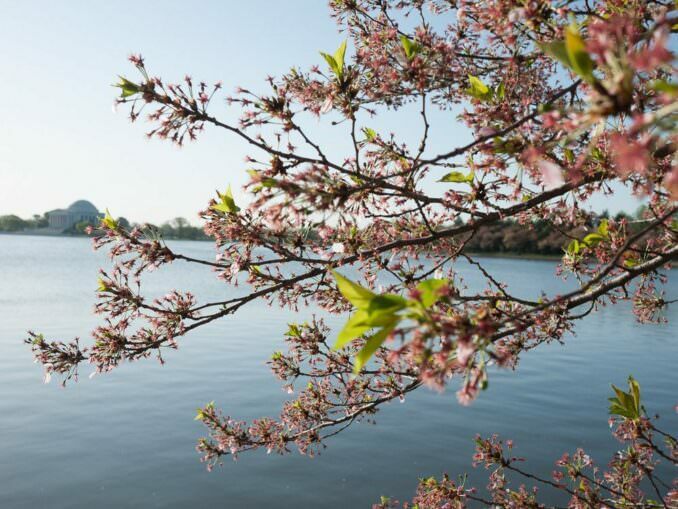 If you do find you have to park further around West Potomac Park, there is a regular shuttle service circulating during the main blooming period. From memory, it was a $1 fare. As for the timing of the bloom, I'm afraid that's anyone's guess at this point. Thank you for the information you post! This helped us tremendously when planning our trip. We were able to be there for the peak on Saturday, April 10!! Absolutely breathtaking to see in full bloom. I look forward to following your site for next year's update! Again, thank you for all your information. Glad you timed it well. See you again next year! We are planning on driving down from Pittsburgh for next weekend (April 17th - 19th). Will it pretty much be over by then? How crowded is it typically the weekend after peak bloom? I so wanted to go this weekend but it didn't work out. Also - love the site. Updates are so helpful and pictures are beautiful! My expectation at this point is that they'll mostly be gone by then, but there's always a chance that some of the ones lagging behind might still have flowers. I plan a couple more updates this week that should give an idea of what to expect next weekend. 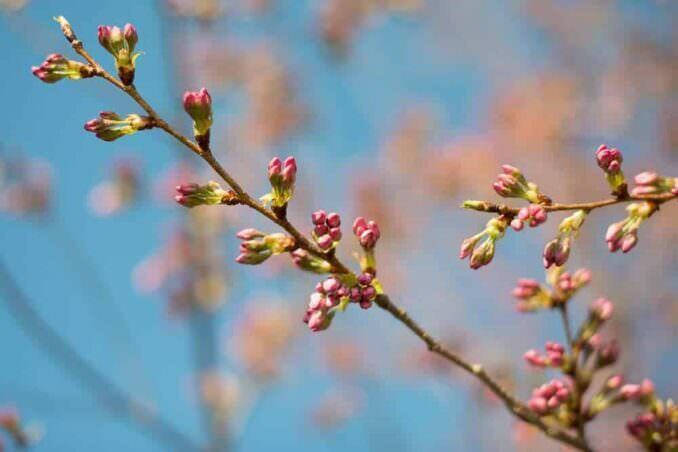 The Kwanzan cherry blossoms might also be blooming by then. They're nearby, and I'll have more on them in the next few days. Thank you so much for your posts. They are being very helpful to me. Please keep posting. I was planning to go on 11-12th April, but, from all your posts, now I think its better to go 18-19th. Any suggestions on that? I will be driving from NYC. Hope not to miss the glory of all those flowers. On more thing, what lens settings you used for landscape (if you still remember) ? That's a tough one, and I don't know that I have much of an answer right now. So far, the NPS is sticking to their original forecast window of April 11-14. And if the peak bloom does in fact end up falling on April 14 or earlier, then the weekend of April 11-12 should be prime viewing and many of the flowers will be well on their way out by the weekend of 18-19. If it comes on the 15th or later, then that weekend looks better and the weekend of 11-12 looks less attractive. Now that we're getting closer I'll be increasing the frequency of the updates. So if you're in a position hold off a few days on making the call, the updates early this coming week should help. And if the NPS is going to adjust their forecast (they may not, of course), my guess is that they'll do it early this coming week. Not sure which specific photo you're referring to. If you can point me to one in particular I can tell you exactly what settings I used (one of the benefits of digital capture). Thanks a lot. I check your updates everyday. Hope I'll get some good forecast by the end of this week. This is my first time to see the beautiful Photo. Thanks for this website. Such great information and wonderful photos. 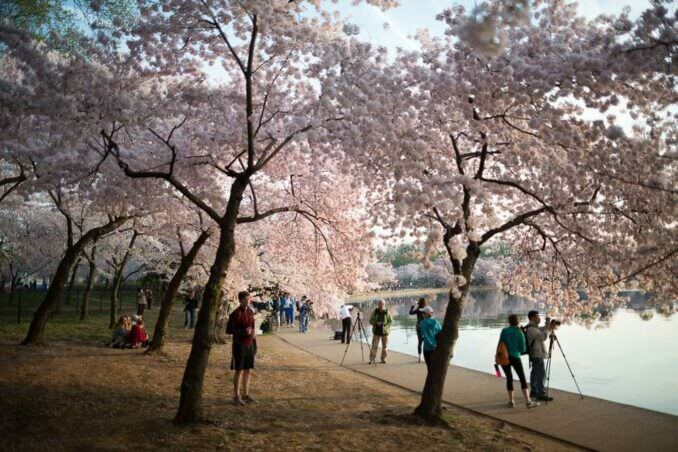 Keeping my fingers crossed that I catch some of the peak bloom on my trip to Washington April 8-13. 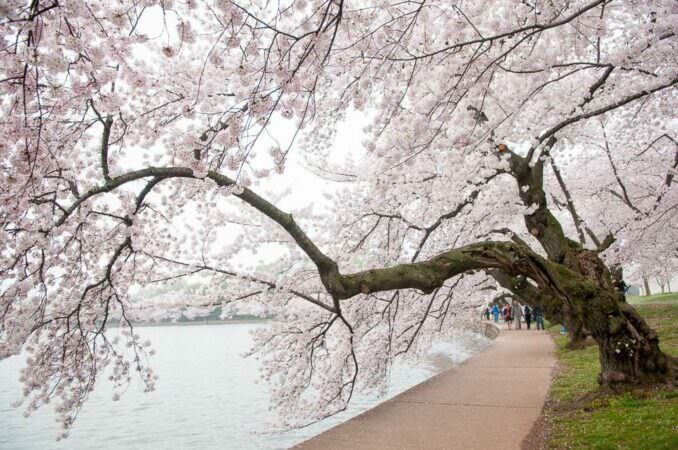 When I can go to see cherry blossom in Washington, D.C.
You can find the latest forecasts here.